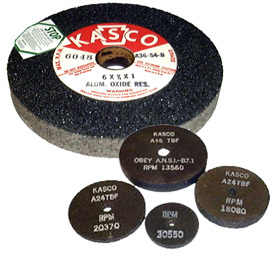 Straight grinding wheels are used on bench grinders and other mounted tools. Smaller size wheels are used on straight shaft grinders for stock removal from castings and weld fabrications. We offer two straight grinding wheels types in the online store. Bench grinding wheels up to 10" diameter, and 4" and smaller T-1 wheels for offhand grinding. Select either categoyr from the left edge navigation list. We manufacture wheels up to 14" diameter so contact us for sizes and grits not listed.